This is the kind of thing that makes me really love the future. Fine Arts Sound graduates come together with a dwindling grip on sonic reality beautifully showcasing the misuse of technology and broken symphonies. A once in a lifetime opportunity to experience the future of emerging sonic artists presenting their carefully constructed sounds. The 13 artists will present a diverse range soundworks that will show a glimpse into the future of music performance, composition & presentation. A show not to be missed and never to be repeated. 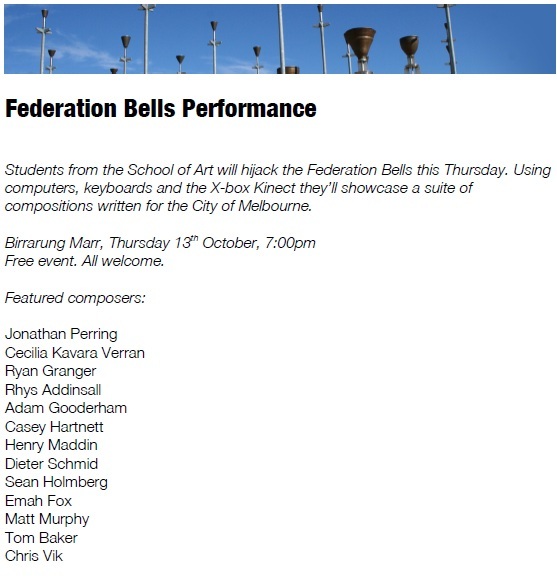 If you’re in Melbourne this week on Thursday night from 7pm (13/10/11) come down to Federation Bells to see me ding the big, metal, MIDI controllable dongs with my trusty Kinect system. The federation bells were built as a public art space that you can upload MIDI or plug in a device to play the bells. I’m fortunate enough to be able to test out my Kinect Max patch on these though my Technology, Composition and Perception class with lecturer Darrin Verhagen. The result will be everyone standing around watching me wave my arms in the air while 40 bells go off around them in a cacophony of dinging, and perhaps a proportionate enumeration of dongings. Only it’ll be super-epicly-awesome because I’m dinging them with technology!